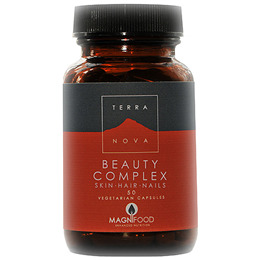 TERRANOVA Beauty Complex For Skin Hair & Nails is a scientifically-based formulation of nutrients for skin, hair and nail health enhanced with highly active, whole and unadulterated superfoods and botanicals. Horsetail is abundant in many nutrients crucial to skin, hair and nail health and integrity, i.e. silicon (which functions as a sort of `cellular glue`), sulphur (especially prominent in hair), vitamin C (needed for collagen production) and calcium. The berries are among the richest natural sources of omega 7 fatty acids, which have come to prominence due to their health and beauty applications - especially in maintaining healthy skin. The high levels of potent antioxidant flavonoids and carotenoids and an abundance of vitamins C and E also justify the use of sea buckthorn in a natural beauty regime. Provides anthocynanidins involved in maintaining the integrity of skin structure. The catechin and epicatechin flavanols found in raw cacao have long been researched for their powerful free radical scavenging properties. Compounds in gotu kola have displayed properties significant to skin integrity and healing, especially the enhancement of supporting collagen production. The historical use of burdock in skin health may be due to various factors, such as antimicrobial properties, the immune-supportive role of inulin (a major component of burdock) and burdock`s potential role in encouraging inner cleansing. Below are reviews of TERRANOVA Beauty Complex For Skin Hair - 50 Vegicaps by bodykind customers. If you have tried this product we'd love to hear what you think so please leave a review. Seem to be helping my nails. No longer bendy. But they taste revolting. Brilliant product, I am 48 and have been taking this for over a year. It has really made a difference to my skin and overall health. This hair loss treatment has really helped my hair to grow again, (as medication thins it) My nails are also stronger and my skin has a glow to it. Would highly recommend. I've never taken "beauty" vitamins because I always thought they were gimmicky and were never vegetarian. After having a baby and breastfeeding, my hair was never the same. It lacked lustre and shine and then I thought I better try something. After reading about Terranova and it's reviews, I caved in and decided to try it. And I'm very glad I did! After only a few days I've noticed a change in my hair - the curls I had in my youth I now have in my 40s. Not sure about my skin but it's only been a few days. This brand really does what it says and I look forward to exploring it further. I've used this for a few months and can definitely say it makes hair grow fast. Not noticed anything different with my skin. Only downside is the hair on other places also grows faster. I have tried several hair loss treatments and supplements and I found it didn’t make a lot of difference, but these skin and hair complex capsules have really helped, even my skin is much better. Exceptionally good for hair health and hair loss, I have been suffering with hair loss for years and have tried everything....nothing worked!! Im taking these capsules only one month and i can see a huge difference!! My hair loss has significantly reduced and its now growing thicker. I am currently taking one capsule per day but i am going to increase it to 2 per day. I will be staying on this supplement!! The best hair, skin, nails product I've used. I can see an improvement in my skin even after taking it for 1 day. It gives my skin a healthy glow.